Joanna Hope Sateen Bodycon Dress is rated 4.4 out of 5 by 5. Exclusive to us - Joanna Hope. A perfect little black dress in heavyweight stretch satin. The dress skims your curves but does not cling. A very elegant dress that's fully lined. With back zip fastening. 98% Polyester, 2% Elastane. Lining: Polyester. Rated 3 out of 5 by Maureen from Beautiful dress but sizing too big Was disappointed as i am normally a size 12 but this dress was huge, i would size down. Dress is very nice and quality is good. Rated 4 out of 5 by Melanie from Nice Black Dress I was really happy with the cut and fabric of this dress, it is really good quality and will be versatile. I did however settle with the next size up though as it is quite tight fitting as the shiny satin fabric did show off my 'curves' a little too much! If you are body confident though go for your normal size. 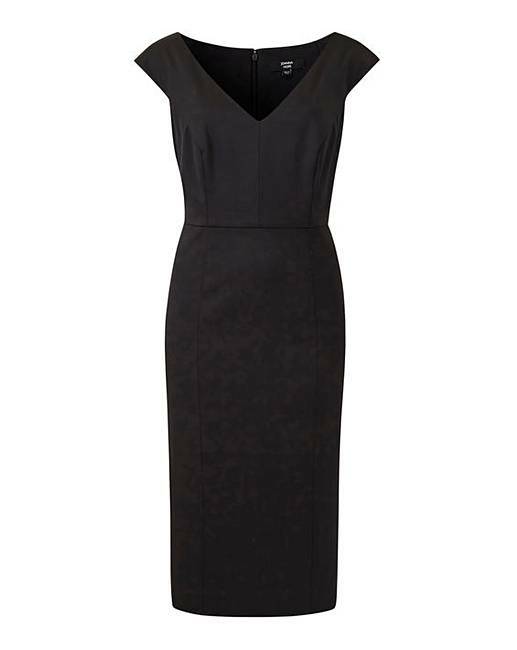 It's a great classic dress and ideal for the party season.